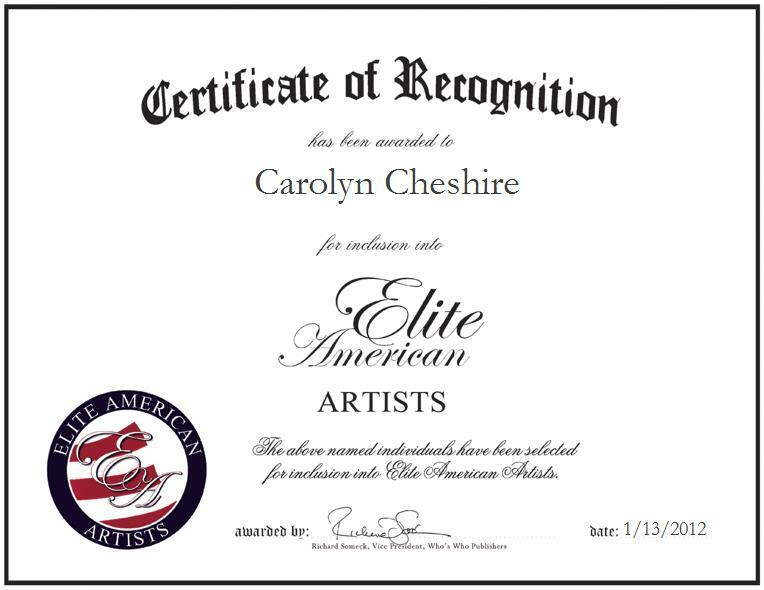 KOSSE, TX, January 13, 2012, Carolyn Cheshire, Professional Artist with CRC Ventures, Inc., has been recognized by Elite American Artists for dedication, achievements, and leadership in the fine arts. Ms. Cheshire, a retired teacher, has demonstrated brilliance as both an artistic leader and creative force in her role as the owner of CRC Ventures, Inc., a sole proprietorship that allows her to put forth imaginative and inspired efforts and generate oil paintings and drawings. She specializes in mathematics and in producing structured and ordered lines that allow art aficionados to admire the appreciation and energy that she puts into each and every piece of artwork she fashions. Ms. Cheshire draws linear pieces with colored pencils, and she utilizes a variety of modalities and methods to convey her perspective to an array of audiences. She also works with acrylic and oil paints, and with charcoal. She conveys original and inspired messages in her paintings and drawings by suggesting tone and color and creating linear strokes. She is always striving to become a better artist, and she is ever passionate about crafting new, beautiful things. In addition to her love for painting and drawing, Ms. Cheshire enjoys making jewelry. With more than 25 years of professional experience under her belt, Ms. Cheshire feels that she has been able to achieve success due to sheer fanaticism and perfectionism. She was inspired to pursue her current career path through the influence of her mother and aunt, who drew and painted; she discovered that she also enjoyed these arts. She originally left school as a senior in college to get married. However, after she had children, she decided to return to college. In the near future, Ms. Cheshire intends to become more involved in art, and to have her pieces shown in a number of expos. She also looks forward to teaching art classes.